Hollywood never ceases to amaze me. Looking to be transported to a Savannah Townhouse with hanging moss, live music, a parlor living room so reminiscent of Boardwalk Empire, it’s as if you stepped into a set on the show? The Sassafras Saloon on Vine should be your next night out. Not only will the feel of this place blow you away with the carefully selected design details (I couldn’t stop staring at everything, even in the vintage bathroom), but the cocktails match the environment. Above the bar hang bottles of double aged barrel cocktails, just like they use to do in the 1880’s. Some of my favorite mixtures from the obviously well prepared mixologists include the spicy Moscow Mule, a Grilled Peach Cobbler, and the refreshing Cucumber Smash. 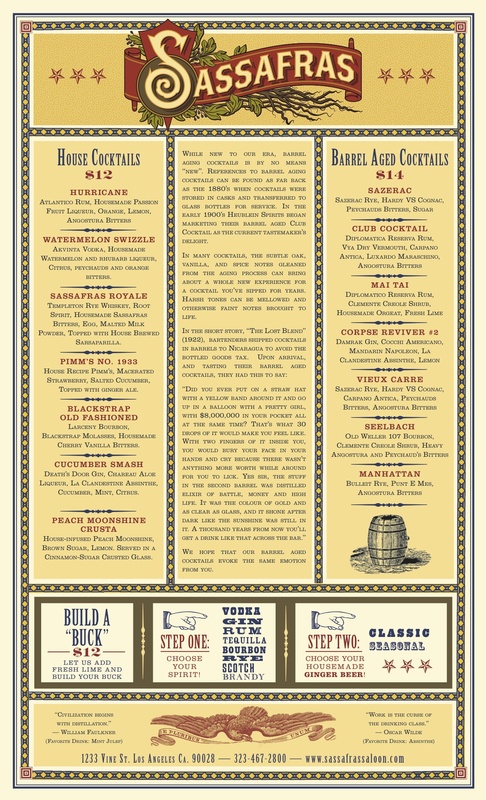 Featuring ginger beer and southern home root inspired libations, find your SASS at Sassafras! Bar snacks are coming soon. Starting at 9 PM, enter through the copper door next door to Sassafras at 1231 N. Vine St. and Genesis awaits, apparently where the dancing begins. Genesis is open Thursday through Sunday til 2 AM and you must be on the entry list. We plan to discover this little secret sassy hideaway Saturday night.